The system 336 has been a proven ribbed base plate solution for urban transport for over 40 years and it is particularly suitable for Metros. With the help of the components, forces generated by a rolling train are deflected into the ground in a smoothly and material-saving way. The highly elastic elastomer intermediate plate made of cellentic ensures high elasticity while the steel ribbed base plate keeps the rail in the track. System 336-M30 with its newly designed ribbed plate has the same quality and functionality (e.g. 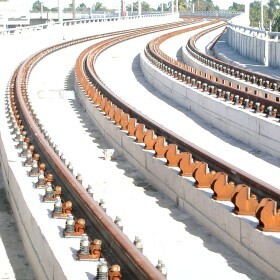 elasticity) as the previous 4-hole version of the wellknown Vossloh system 336 – but only 2 anchor bolts are needed for connecting to the underground.